I’ve gotten serious about trying to get my kids more involved with what goes in their lunch boxes. This past Sunday I was out of town and, as a result, I missed my usual weekly farmer’s market shop. Sigh. When I arrived home from the airport later that day, Chloe and I decided to have a little mommy-daughter time, which involved a grocery shop at Trader Joe's (my happy place). We had taken the Weelicious cookbook along with us so Chloe could pick a few recipes from it that she wanted to see in her lunch box. When she zeroed in on the whole wheat English muffins, I asked her what she thought of me making her an English muffin pizza. Her eyes lit up like light bulbs (I'm now thoroughly convinced that if you can figure out how to tag the word “pizza” on to a recipe it's destined to become a hit with kids). This year has become even more busy than last for our family, with more homework, more after school activities and just more general running around. As a result, I feel like I require my sleep more than ever, so I try hard to make my kids' lunches the afternoon or night before. I’m also attempting to use as few ingredients as possible in my recipes so they are even easier to toss together. 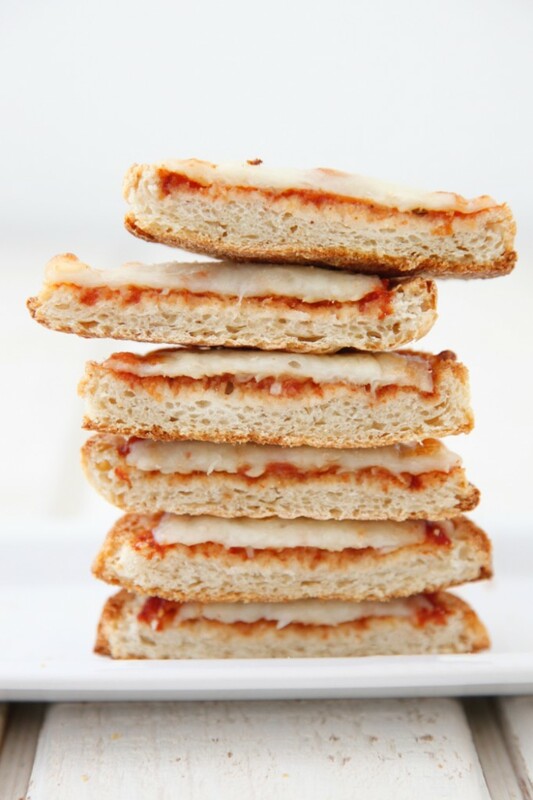 You can top these English Muffin Pizzas with any topping you'd normally find on a pizzeria pizza or simply try a more basic approach, using on cheese and Weelicious Tomato Sauce, as I did here. 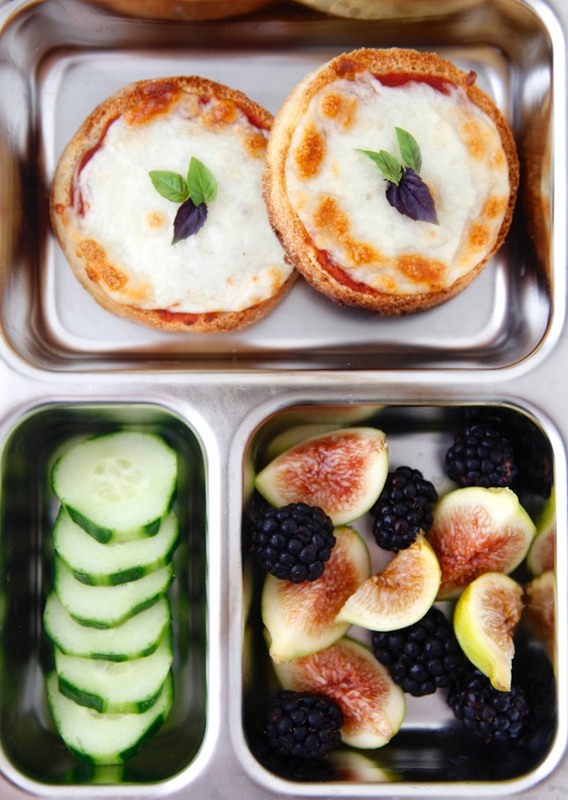 I even made these into an English Muffin Pizza sandwich (and took a pic of it here). 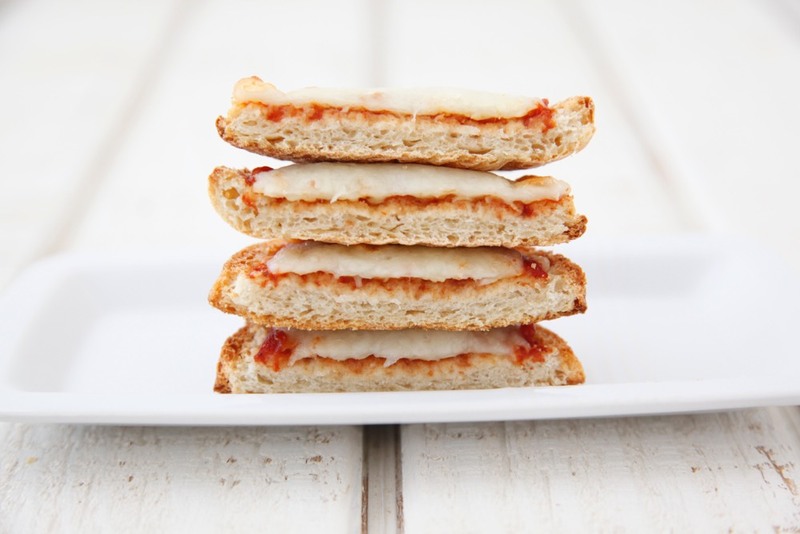 Using only three ingredients, these English Muffin Pizzas are a total timesaver and now a permanent part of my lunch, and even dinner, rotation! 2. Place the english muffin halves, cut side up, on a baking sheet and bake for 5 minutes. 3. Remove from the oven, spread 2 teaspoons of pizza sauce on each english muffin half. 4. Sprinkle 1 tablespoon of cheese on each english muffin half. 5. Place back in the oven and bake for 3 more minutes, until the cheese is melted. Note: Add other toppings to the pizzas at the same time as the cheese if desired. I love these! 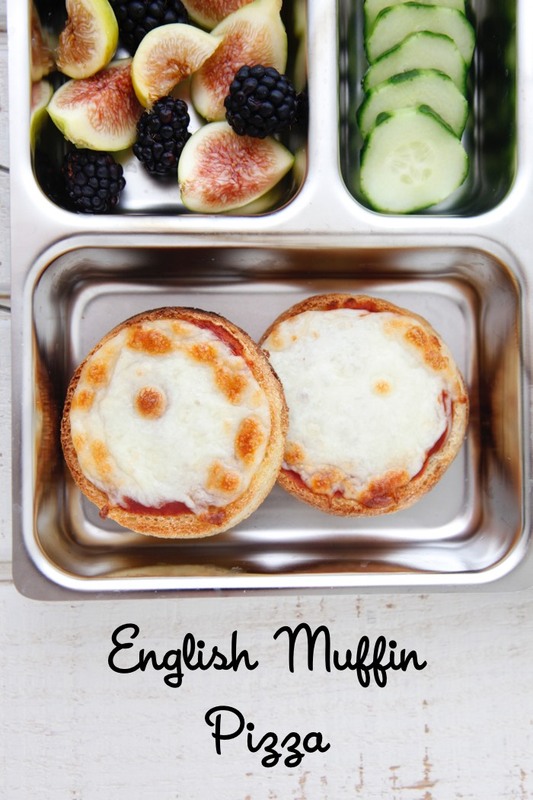 I remember learning how to make english muffin pizzas in middle school Home Ec years (OK, decades) ago. They're a great 'introduction to the oven' recipe. Just curious how well this works as a school lunch. I see a lot of lunch ideas that look good, but I don't think they'd be very good cold, after a few hours sitting in the lunch box. I've tried sending cold pizza and my kids won't eat it. Every child is different. Both of my kids enjoy room temperature foods, so these work great. I completely cool them on baking before adding to lunch boxes so they don't get soggy and stay crisp. Hope that helps! My mom made these yummy pizzas when I was growing up. Love the made to order aspect. So fun and so easy! So you make morning of, not night before? We made these as kids, too! Because my 12-year old only eats pizza derivatives, we make these a lot. Another one she likes is a riff off the goat cheese pizza at CPK. Red peppers, onion, garlic on tomato sauce with goat cheese dotted on top. I grew up making these as an easy self made meal. I am concerned, however, that they will be soggy by lunch. Even with letting them cool prior to packing, the sauce has got to get absorbed by the english muffin. 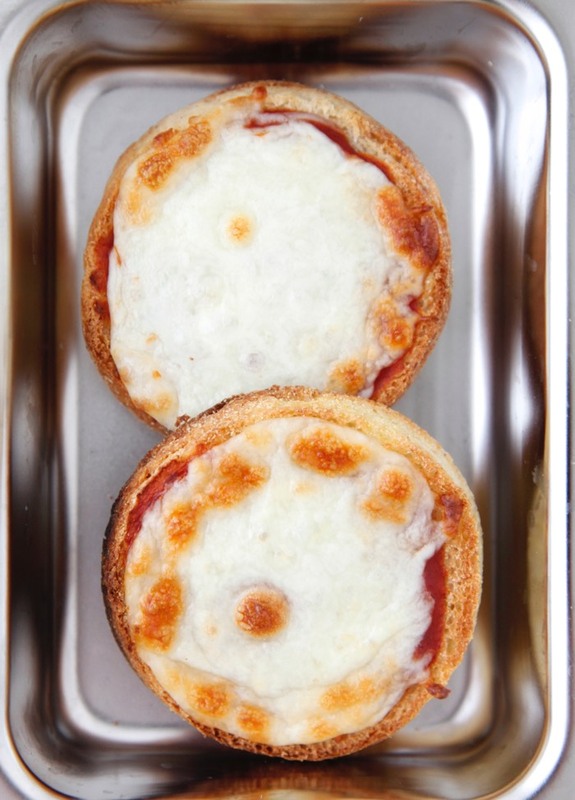 My mother did these kind of easy pizza on a hamburger buns and we knew it as hamburger bun pizza. I introduced them to my husband and friends and everyone LOVES them because they're quick, easy and totally customizable. We've since done English muffins, and also found that pita bread is a great option. I've got a friend who swears by tortillas, but I haven't found that to be as satisfactory unless the plan is to cater to my four year old's need for \"roll up\" food. Such a great easy option for my little one! Could these be frozen so I could just pop one out when I need it and heat it up? Would I freeze it before I bake it or after? 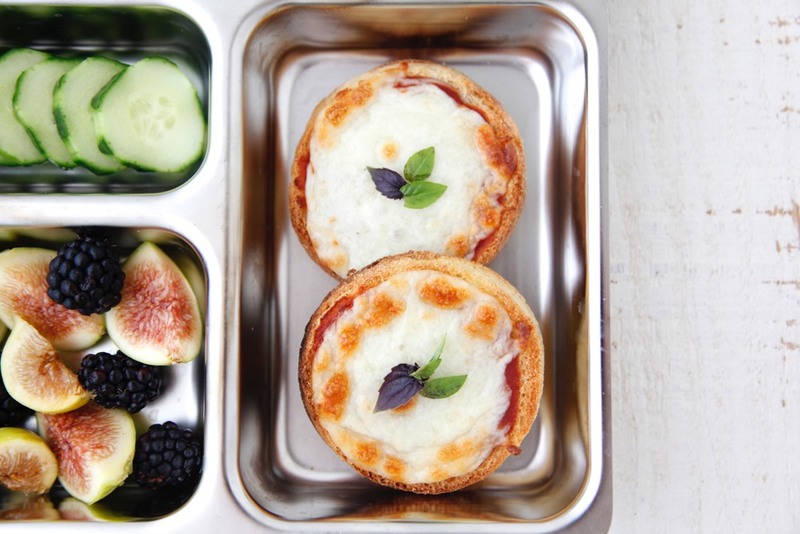 These look like an awesome lunch idea for the kids AND me. So simple and so delicious!